Will all the money we spent and time put go to waste if I screw up this interview? There is also the possibility of not being with my boyfriend (at the time, who is now my husband) because the process took so long and being apart for a longer period of time could make a dent in our relationship. And I hope you do, too. So, here are some tips I can share with you based on my personal experience on some things you can do to be prepared for that big day. I mentioned in a list of hotels near the US Embassy that I did before that booking a hotel near it made my life way easier. It just eliminates the stress of where to put your electronics because you can't bring them to the US Embassy. What my family did when they had their tourist visa interview was to bring my sister (who wasn't going to be interviewed) and have her bring all the items that the Embassy won't allow inside. This is an added cost and needs more coordination than simply having a hotel room to leave everything. There will be a lot of waiting in line and sitting down so I suggest wearing comfortable clothing. Avoid tight-fitted clothes and heels if you can. This will be a shorter wait but almost similar to what you went through in the SLEC medical examination. I sat in (hard) chairs for a good 40 minutes and stood for 10 minutes while waiting for my turn to be interviewed. I just wore yoga pants and a shirt which I am very thankful for. Big bags are a no-no to bring in the US Embassy because this can store many prohibited items in them. Opt for a small bag for all your essentials and an expandable envelope for all the documents you brought. This doesn't just mean laptops and cellphones. This can go as far as power banks and earphones. When I was going through the first security check, the lady in front of me didn't have her cellphone because she left it with her companion but she had earphones which she was prohibited from bringing. Can I just hide them in the bushes? The security personnel said no because there are CCTV cameras pointed to them. She ended up throwing them away so she can carry on with her interview schedule. Triple-check if you have all the documents needed for this interview because even just one missing paper can delay your visa processing for months. The interviewer didn't look at any of the proof of engagement I brought and just simple questions about our relationship. On one hand, I was sad because I prepared so much on that part and had one big clear book full of our photos and chat logs. On the other hand, I'm still thankful I brought them because what if they asked for the proof and I didn't have them? That would have been a disaster. You won't be let in the facility if you arrive too early before your appointment because applicants are brought in by batches. While waiting, there are no comfortable waiting areas outside the US Embassy so you're going to stand up under the sun or a tree (if you're lucky). I arrived around 30 minutes before my interview schedule and that worked well for me because I got in instantly after I arrived at the gate. There was one couple who were together while waiting for the interview. If your fiance(e) is in the Philippines and you want some support, you can bring them along. I just went alone because my fiance was in the US when I had my interview. When all has been prepared and you get to the final moment, it will all boil down on the interviewer's judgment if you are in a genuine relationship and not just to get this visa for a green card. Be firm with your answers and just casually tell stories about you and your fiance. Don't appear to be too scripted and just think that the interviewer is someone you just met who is genuinely curious about your relationship. 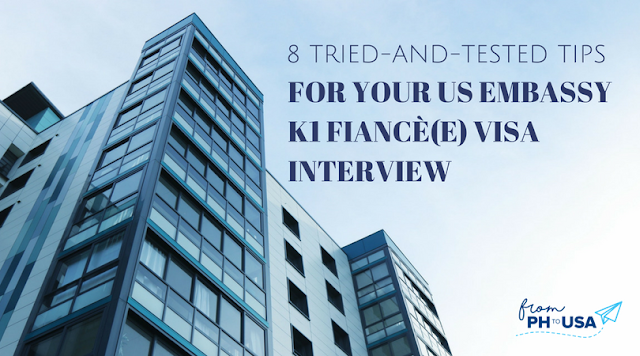 Passing the K1 Visa is really a combination of hard work, preparation, and good luck. Take the parts of the process you can control and prepare for and do everything you can to make them as seamless as possible so you can ace the big day. lagi ko nababasa na dont bring any gadgets. pero wala nag sasabi na meron naman pala pwede pag iwanan, meron naman pala. Puede din diyan Yung Visa applicants or just for other guests? Bilib ako sa mga taong nakapaligid ng US Embassy. May nagtitinda ng ballpen, payong at tubig. Pero ang pinakakakaiba eh yung sa kanila mo iiwan phone mo bago ka pumasok. Hindi ko lang alam pano ang kasunduan nila doon since I never availed that kind of service. Sino na ba nakatry non and magkano at pano makakasigurong andon pa siya pagkatapos ng interview? Haha. Curious. Also meron akong friend na nakapagdala ng phone sa embassy. Siyempre pinalabas siya at bumalik pa siya ng kotse para iwan doon phone. Family interview yon pero hindi siya umabot sa schedule. Naapprove buong family. Pinabalik siya ng embassy for a separate interview. Ayon, nadeny.